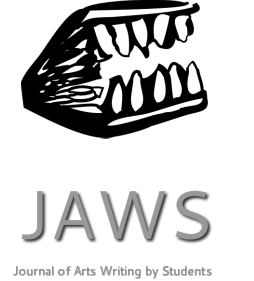 JAWS is the Journal of Arts Writing (for and by) Students, serving as a platform for peer to peer engagement and for research currently taking place within institutions as part of MA and PhD study. Originally founded at Chelsea School of Art, JAWS has been published by Intellect since 2015, and is the first academic arts journal entirely produced by and dedicated to current students' work. It works to open new lines of discourse and collaboration and seeks to promote early career researchers across a wider academic community, demonstrating the ability, dedication and professionalism of students. The editorial board and contributors are all current students or recent graduates, and JAWS is keen to foster relationships with Art Schools and Colleges across the UK and internationally to maintain our commitment to students. Publication in the JAWS journal provides students with valuable experience of writing for an academic journal (an essential component of PhD study or an academic career) as well as circulation and recognition of their research. It is not only an opportunity to take their academic writing to the next level but also to share outcomes and findings across a research network. We at JAWS believe strongly in research as a living pragmatic entity - it should not languish unread in a file, bending bedroom shelves, as it is only through sharing and discussion that new ideas can be allowed to develop and grow. ​If your University Library doesn't stock JAWS, most students will be able to download copies using their institutional access (Open Athens, Shibboleth) through Ingenta Connect. Theoretical and discursive essays up to 6000 words. Critical reviews of events, exhibitions or performances up to 3000 words. Submissions of practice accompanied by text. The word count for this type of submission can be negotiated through the peer review and editing process, but we recommend between 3000 - 5000 words. All work must be prefaced with a 100-word abstract and 6–8 keywords, and followed by a short contributor biography. Please include your university affiliation, full name, course and year of graduation. All work must use Harvard referencing, following Intellect House Style. For full submission guidelines and information about the peer review process we employ, please refer to www.jawsjournal.com/submissions. ​ For all inquiries please email rob@jawsjournal.com. JAWS Issue 4.2 is OUT NOW! The latest issue of #JAWS is out now! We have now made all our guest editorials FREE to download, so even if you have not yet subscribed you can still read all of our fantastic guest editorials, most recently with Curator Alice Bonnot. This issue also includes reviews, articles and artwork from students at Newcastle University, Norwich University of the Arts, University of London, University of the Arts London and the University of Chichester.